From the viewpoint of staffing buyers and hiring managers, nothing is more important than the delivery of consistent, high-quality service throughout the requisition fulfillment process. Receiving regular updates on open orders, being assisted and advised by competent and conscientious staffing agency personnel, and having well-defined delivery processes not only benefits HR and hiring managers, it impacts your company’s ability to compete for top talent and maintain high levels of productivity. Unfortunately, a recent survey revealed a troubling gap between the perceptions of clients and staffing firms when it comes to service delivery. Staffing firms rated their service as 8.81 out of 10, while clients ranked the service they receive from staffing firms as 5.98. But, the good news is that the gap is a problem that staffing firms can strive to resolve. If you’re tasked with managing a contingent workforce program, how do you make sure that your staffing suppliers meet your quality standards? Experts say that managing suppliers effectively and ensuring that they follow a service delivery framework increases performance levels and improves service delivery. Here’s a look at the elements that enable the delivery of high-quality service by staffing suppliers and some ways to work together toward a common goal. Hiring managers and top candidates don’t like to be left hanging. At eTeam, we believe that providing regular and detailed progress updates is a key strategy for creating value and exceptional customer service. It starts with implementing a consistent, daily schedule for status updates on open orders. Timely status reviews not only keep requisitions and resumes from falling through the cracks, they promote a preemptive approach to service issues, especially in cases where staffing firms are having a hard time filling positions due to low wages or extensive requirements. When companies are competing for the services of contractors with in-demand skill sets, being able to get information to hiring managers and candidates is critical and having staffing partners who provide updates without being asked is a necessity. When it comes to maintaining consistent service delivery, a key differentiator lies in a staffing firm’s service management system and their ability to execute. Research suggests that quality comes from putting systems in place to ensure that everyone does things the same way. That’s why top performing staffing firms develop a service delivery model or framework that maps out client-specific delivery processes, communication protocols and workflows. 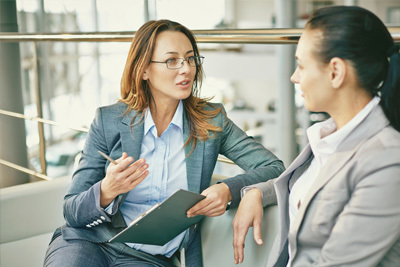 Putting a structure in place helps staffing execs and account managers maintain control and consistency by establishing service standards and a foundation for training. The model also spells out core principles and values that guide interactions with clients and candidates, so that quality becomes part of the culture and the behaviors and habits that drive service excellence become second nature to agency staff. To drive quality throughout the service delivery process, staffing clients and staffing leaders need access to key performance indicators (KPIs) and quality metrics that encourage self-monitoring, rapid detection of service defects and speedy resolutions to rising demand for contingent staff and lagging response rates. In fact, a benchmark study by Aberdeen confirms that implementing standard metrics and procedures improved supplier performance by 26.6 percent on average. The areas of improvement came from quality, on-time delivery, price, total cost, contract compliance, lead times and overall responsiveness. Of course having access to data is great, but it’s how you use it that matters. For instance, staffing executives who keep tabs on their team’s performance by monitoring variances in resume submittal rates, average response time or filled orders several times a day set the tone for exceptional, quality service delivery. Instead of waiting until a hiring manager complains, quality-focused staffing leaders notice downward trends, seek input from clients, and suggest potential resolutions right away. When they don’t deliver, they hold people accountable and both parties work together to solve the problem. Certainly, quarterly scorecard reviews and evaluations of end-user feedback and satisfaction surveys can help staffing clients monitor execution and identify quality-driven suppliers. But chances are, suppliers that maintain high levels of performance don’t wait until the end of the quarter to find out how they’re doing. Their managers conduct regular, internal reviews of scorecard data that compare actual results with quality benchmarks. Specifically, they want to gauge the effectiveness of corrective and preventative action plans and ensure that the firm’s delivery model aligns with the client’s customer service goals and objectives. After all, delivering consistent, high-quality service doesn’t happen by accident. It happens on purpose.